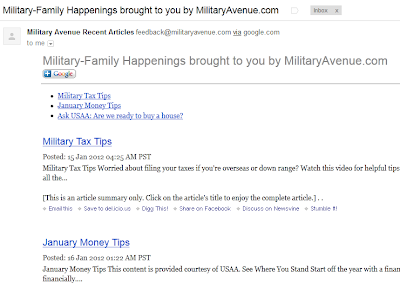 Over at our parent site, MilitaryAvenue.com, we share lots of great things including Military Discounts, Installation Information, and Current Military News from sources like the Department of Defense, USAA, Military Community and Family Policy and so much more. This is news that you can use as a military family! Interested? 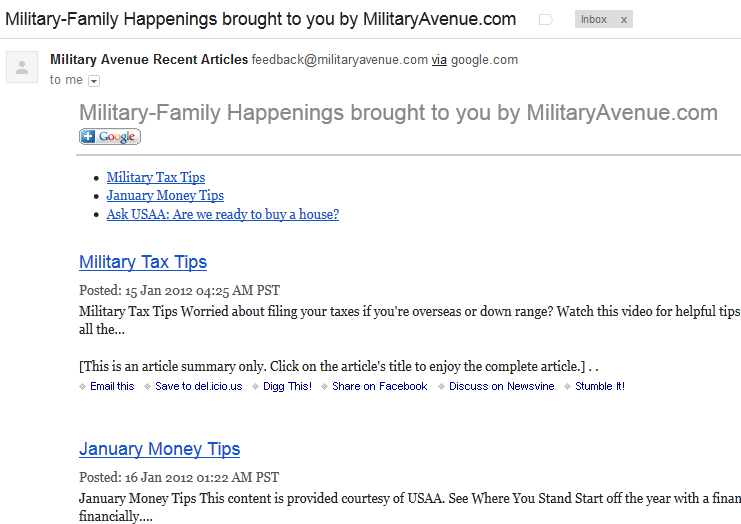 To sign up click here: http://feeds.feedburner.com/MilitaryAvenue and then on "Get MilitaryAvenue Recent Articles delivered by email" (see image below). Nice post. Every individual needs oxygen to get by on the planet. Guidance is as fundamental as this since preparing thesis writing service gives people the learning and capacities they require. Preparing is basic to people everything considered and it has no confinement. Youths require guidance with the true objective for them to make sense of how to talk and to create.